Potts Research Group Blog: Hydromulching for thicket restoration: plucking our way towards thicker thickets? Hydromulching for thicket restoration: plucking our way towards thicker thickets? Question 1) What is hydromulching? Well, it essentially involves using a big hosepipe to spray an organic mulch suspended in water over a particular area of ground. The mulch itself comprises ground up wood fibres and an organic glue-like substance called 'tacikifier'. This tackifier makes it possible for the hydromulch to be applied to very steep slopes as it sticks the mulch to ground. Hydromulching (also known as hydroseeding) is generally used to plant seeds in a matrix of organic-rich mulch with the goal of ecological restoration in mind, especially in challenging terrain. Question 2) So what does it have to do with spekboom? Well, planting spekboom cuttings is slow, tedious and often seems to be quite unsuccessful, contrary to the plants ability to grow ridiculously fast in terribly harsh environments. The dream of a future filled with spekboom monocultures sequestering carbon, and spontaneous return of thicket biodiversity has become more of a nightmare from hell, with failed restorers now scratching their heads and feeling the burn of their lightened pockets. The apparently low levels of success are, in part, a result of an ignorance spekbooms ecology, and the "fill in the gaps" protocol that is applied by spekboomveld restorers. Question 3) What do I mean by this? Well, the most common way spekboom is planted involves cutting approximately 50 cm branches off of larger spekboom and planting them into holes dug into the ground in a grid with 2 m spaces between cuttings. Unfortunately by planting spekboom into deep holes away from shelter and in such low numbers, survival is very low, usually because drought, frost, or herbivory induced stress take a massive toll. When some thought is given to this method of planting, it seems quite obviously unnatural, and perhaps the low levels of success are actually unsurprising. Question 4) So how do we do it naturally? Well, in nature spekboom doesn't spread by being cleanly cut into long truncheons and then stuck deep into the ground. Elephants - natural masters of thicket engineering - rip whole branches off the plants and strip these of small lateral twigs and leaves, many of which fall to the ground and into the undergrowth, possibly near a healthy dose of elephant-produced mulch (their dung!). Many of these 'propagules' will have fallen into sheltered microhabitats away from the sun, the night sky (which is important from a frost perspective - read this post), and of course the hungry eyes of the many antelope found in thicket. These small propagules now stand a FAR higher chance of growing roots and quickly establishing a healthy root:shoot ratio (read this post), compared to those unfortunate branches cut and expected to survive the extreme conditions existing outside the thicket clumps. The idea discussed in a small Baviaanskloof workshop was that the larger the cutting, the longer it will take for it to establish a healthy root:shoot ratio, where sufficient root development can supply enough nutrients to the shoots for growth and development to occur. A small cutting might only need a few months before its root:shoot carbon balance is stable and vigorous growth is achieved, whereas a large cutting might need years. This is especially true in areas of low rainfall where spekboom usually thrives. Cuttings are usually planted into quite deep holes (>10 cm). When these cuttings are dug up after some years, one can find that their roots often grow towards the surface (see this post). This means that they aren't getting enough water down there in the deep holes. It takes a rare rainfall event for water to seep more than 10 cm into the ground in these areas, which means that your cuttings are essentially missing out on most rainfall events that merely dampen the surface, and that's not good. Surely surface-originating roots will be able to take greater advantage of light rainfall events. Based on field observations by Alastair Potts, I want you to do an experiment. 1). Go to the nearest spekboom (if there are none nearby, look at the figure below). 2). Pluck off some small lateral branches (I'm talking about very small branches with <10 leaves). Q: Where does it break? Q: How much does it 'bleed'? A: Hardly at all (if any). 3). Now remove similar branches using scissors. You will notice a lot more bruising and fluid being lost (also see below figure). Q: Which is better for spekboom? A: Well done, you guessed it (I hope)! The one that doesn't involve unnecessary cellular damage, fluid loss and exposure of the sensitive stem innards of spekboom to the multitudes of soil pathogens. Question 5) So why does this happen? Because spekboom evolved to reproduce like this. The lateral branches easily snap off the main stem at their nodes. They naturally seal here (compare lost moisture on the stem in the figure above), closing off the sensitive internal portion of the stem from water loss and infection. A major contributor to death of spekboom cuttings is the fungal infection that occurs where they were cut (a point raised by first raised by Bruce Taplin at the 2015 Thicket Forum). 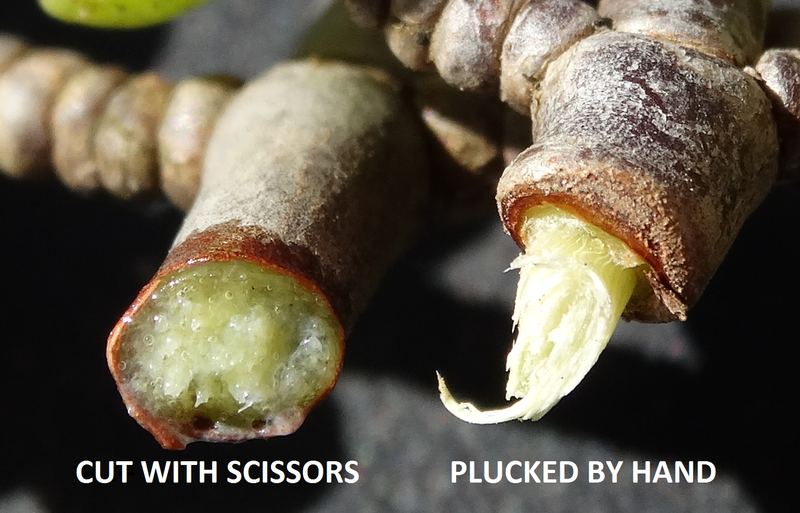 This needs to be avoided, not by sterilizing scissors, secateurs or knives, but by not cutting the stems at all! Don't cut them, pluck them! Using the elephants model of spekboomveld restoration might be a far more effective method. Question 6) So should we put elephants everywhere? No, don't be ridiculous. That would be a circus! Question 7) So what then? Aha! That's where hydromulching comes in. What we did in early August 2016 (Japie Buckle, Klaas Basson, Alastair Potts, Nicholas Galyszynski, & myself), is took 100 kg of tiny spekboom 'pluckings' (lateral branches <10 cm long, broken off the main stem as an elephant might do), and scattered them at random across a 50 x 25 m area. 100 kg of tiny spekboom pluckings means a lot of bits on the ground. More pluckings than I have time to count. If we had planted 50 cm tall cuttings in the traditional 2 x 2m grid fashion, we would only have had around 300 in the plot. Instead, we flooded the local market with tens of thousands of pluckings, hoping that if only a fraction of these land in favorable microhabitats and survive, we would still have hundreds of spekboom growing after a few years. Next, we sprayed the entire area with an approximately 1-5 cm layer of hydromulch (see figures below). The idea here is that the mulch would provide the spekboom with a growing medium that readily retains water, provides protection from hot days and cold nights, and also gives it a chance to root out of sight of herbivores. Previously we tried putting the spekboom pluckings into the mixture and spraying it through the hose onto the landscape, but we soon figured out that this was a bad idea. Succulent plants aren't very well adapted to being forced through a high pressure sludge pump, and the hydromulcher turned out to be more of a hydromincer. What happened was that we ended up turning tiny pluckings of spekboom into even tinier cuttings of very finely chopped and juiced spekboom. Not ideal. Nor unsurprising when one considers that spekboom pluckings that elephants eat do not grow out of their dung after being digested, they grow when they drop to the ground and, if they are lucky, covered in the mulch-like dung! So now we wait. Soon we will go back to our site and see what kind of success or failure we have achieved. Perhaps we are being completely unrealistic, and we are doomed to failure, but maybe not. Maybe hydromulching of spekboom pluckings will work brilliantly, without loss of precious person days (plucking spekboom is time consuming!). Time will tell. P.S. NB! If you are intent on hydromulching, make sure you have plenty of water quite close at hand. We used about 20000 l to cover a 50 x 25 m plot. We did however make the mixture a very light one (somewhat unnecessarily), with about 10 kg mulch per 1000 litres of water, and it is possible to make a much heavier mixture to save water. Is there any update on the recruitment of the plants?